Sweet Treats is a Victorian style corner sweet shop at 597 Roman Road. 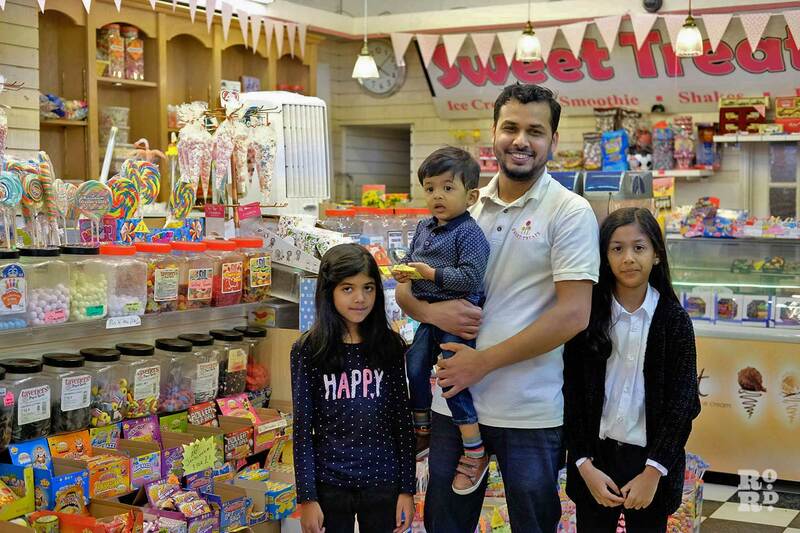 Owner Naz Islam talks with us about opening the shop, the halal and vegan sweet variations, his family life in East London, hunting down discontinued sweets, and competing with Poundland. 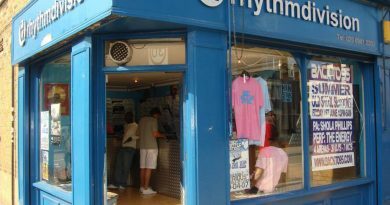 He also shares the shop’s ‘claim to fame’: being featured in a music video by artist Showtime Shegz. Naz Islam opened Sweet Treats five years ago, making it comparatively new on such a historic road. However, he considers himself a long-time Eastender after growing up in and around Brick Lane and Bethnal Green. 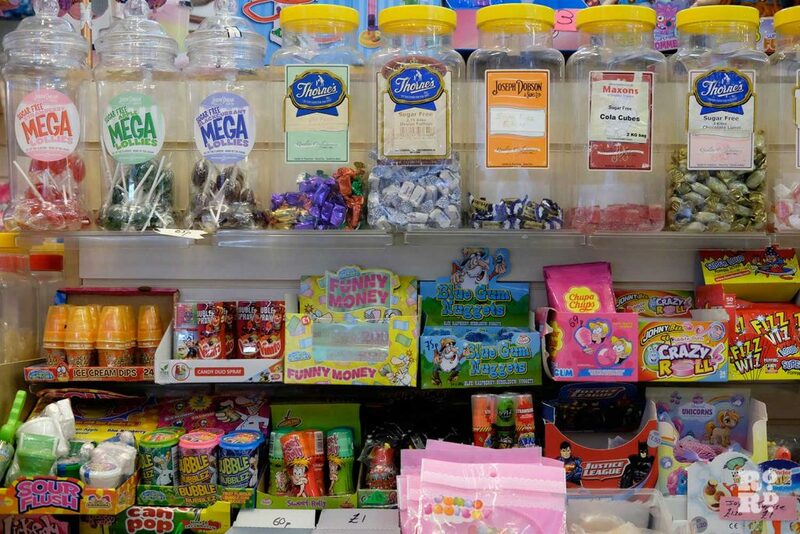 His shop focuses on old fashioned loose sweets, but also has toys, new sweets and popular brands. The fittingly painted ‘candyfloss blue’ coloured exterior is part of a clean cut, sophisticated shop front that benefitted from a Tower Hamlets Council development program a few years ago, implementing his chosen style of a shop straight out of the Victorian era. Before Sweet Treats, Naz Islam worked with his brother in a corner-shop in Bethnal Green, and later ran an internet cafe. He only considered making the move to sweets when he saw a gap in the market. ‘I think it was to do with not finding sweets that are halal. From there, old-fashioned sweets were the next step. When I looked into it, most of their ingredients are actually halal. Very few of them use gelatine or have anything in that’s not permissible to me’. 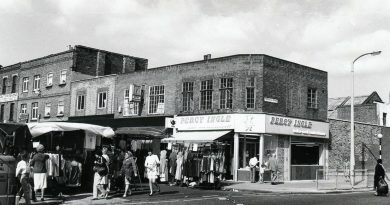 His long-time familiarity with East London markets was one of the deciding factors for opening on Roman Road specifically. 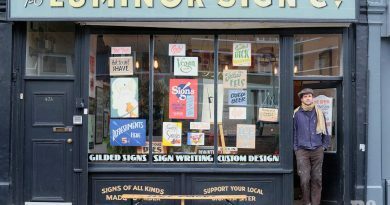 He recalls a newsagent near Columbia Road Market, beside his old school Daneford (now Bethnal Green High School), where he’d always find his favourite sweets: Rhubarb, Custard, and Cola Cubes. 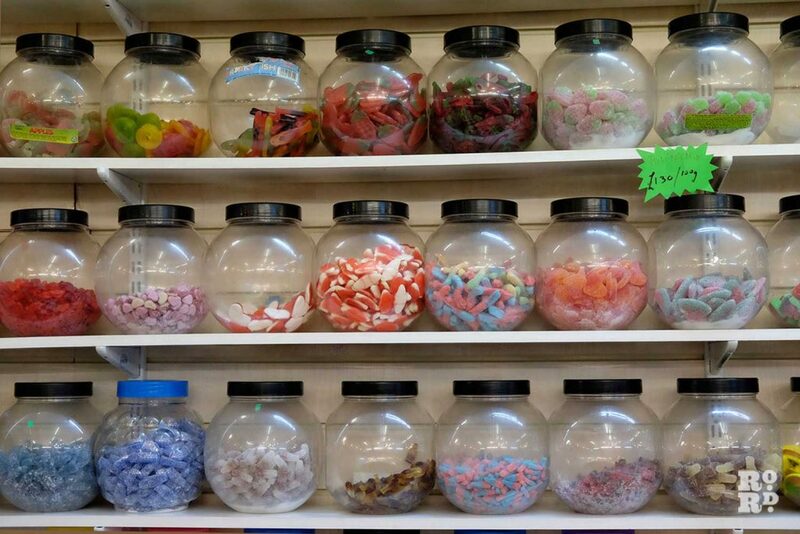 ‘The whole of the back wall was old-style sweets, I guess that has stuck with me.’ He says as he looks over at his own tall wall of old-fashioned sweets, with rows of jars engulfing the right side of his shop. He’s found that within the last five years, most manufacturers are moving towards halal, veganism, and vegetarian sweets, making it easier for him to stock them. He says about 50% of his customers come in specifically for these variations. Curbed originally by a low starting budget, Sweet Treats built on its old-fashioned feel slowly, trying to move forwards into more popular items, while also maintaining the classic sweets for when the business felt stronger. While the older generations loved the concept from the outset, Sweet Treats needed greedier sweet-toothed customers to stay afloat, and so had to go bigger, ‘Most kids don’t understand old fashioned loose sweets. They want a sweet that has a picture of spiderman,’ he says. 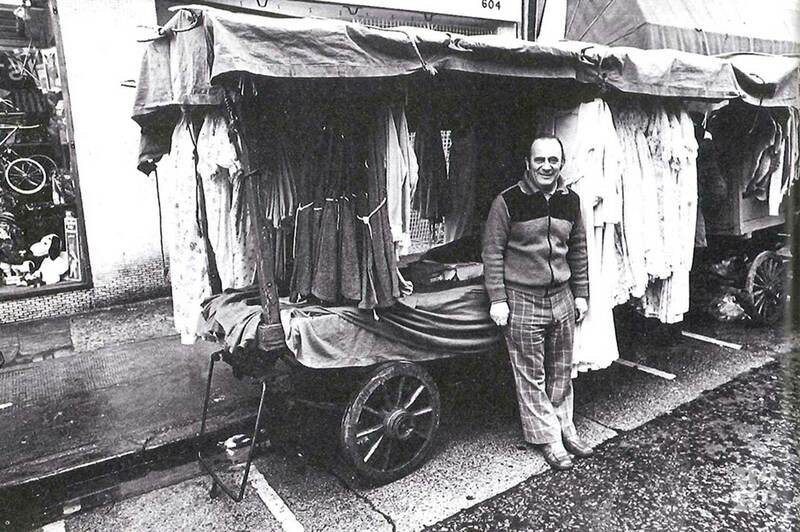 Instead, convinced of his own audience and making his shop more niche and particular, he no longer considers them a rival. ‘I noticed they had old-vintage style sweets in little jars the other day’ he laughed, ‘I tasted them.’ His face said it all. 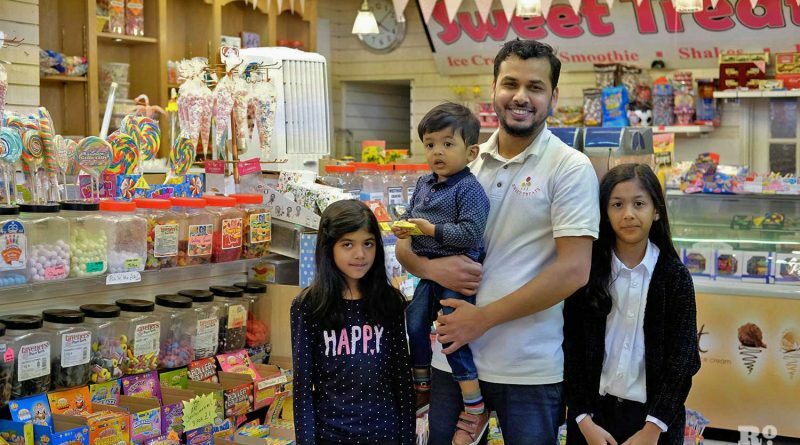 Momota Islam, Naz’s wife, is also becoming more hands-on with the business, and has recently started their social media channels, propelling Sweet Treats into online visibility through Instagram and Facebook. Their kids have their own ideas too, serving as perfect customer research, although Islam says there is an uncanny similarity between the toys they want for the shop, and the toys they simply want for themselves. ‘Everything they see on YouTube, they want you to get’ he laughs. Sometimes these people don’t just stumble on sweets they thought were discontinued and have fallen off the shelves, they’re actively on a quest for a specific taste, like Woody Harrelson’s Tallahassee in Zombieland and his twinkies. Islam always views it as a personal challenge to find that sweet if he didn’t already have it. He’d usually find them, but to this day he can’t get his hands on lost, discontinued wonders like Apple Jacks, Frosties (a cola cube with a chewy centre), and Buttered Brazils, which are rich hard toffees with a whole roasted Brazil nut inside. Naz Islam currently has an aisle of his shop closed off and awaiting its re-opening for the summer sweet boom. This new aisle will have more vegan treats and some newer fashionable American sweets. He’s not abandoning old fashioned gems though, in fact quite the opposite. ‘It’s a change, things move on and you have to move with it. It depends on what you take with you, I see it like that. I keep my roots with me. 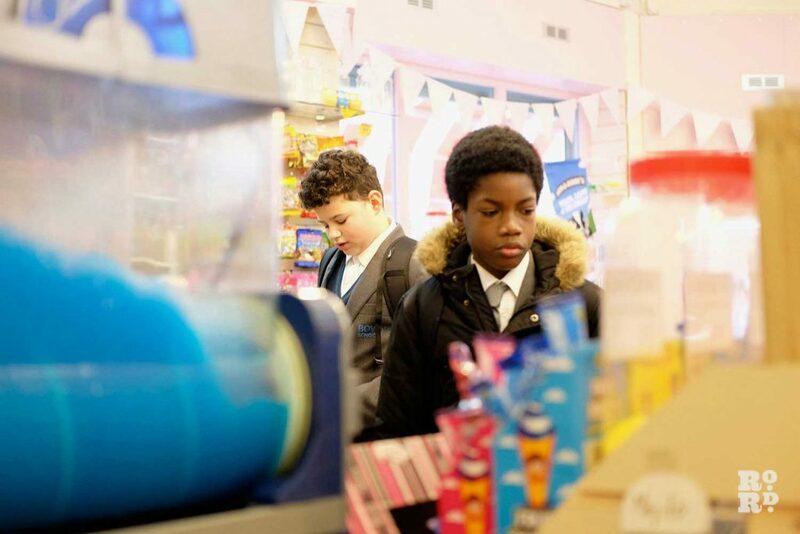 Whatever happens, as long as I have this shop, I will always have old fashioned sweets in here.’ Islam is also currently toying with the idea of an online shop, convinced it’s the next step to get his sweets out there, but hasn’t decided anything yet. His sweet shop has its own claim to fame too, being where musical artist Showtime Shegz (@showtimeshegz on twitter) filmed his music video ‘Sweet Life’. Showtime Shegs, Segun Sowemino, has been making music in some form since primary school, but started an official music career from 2016. He spotted Sweet Treats on his way to Poundland and thought it was perfect. ‘The shop was exactly what I was looking for, bright and full of sweets, the name of the shop went perfect with the title of the song too. Naz was very accommodating and helpful and without his cooperation the video probably wouldn’t have come to existence’. Sowemimo leads a double-life, and when not making music works as an Enrolment Officer for Idea Store Library to pay the bills. As we left the sweet smelling shop, interrupted by the school rush, we caught a glimpse of Naz Islam with the local kids. He knew them by name, knew what they were after and even knew one student must have been late for school again because he arrived later after getting held back. We can’t help but feel that Naz Islam’s friendly attitude was another key reason the shop was doing well. 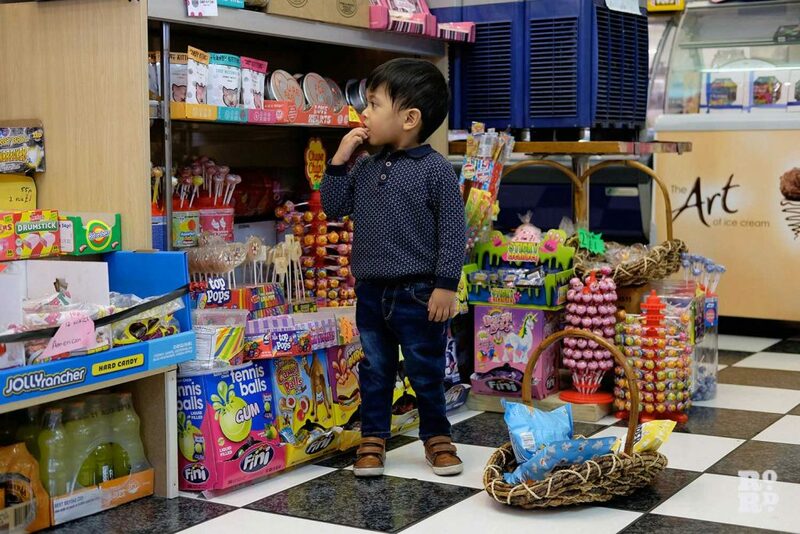 Arqaam Islam, 2, in his favorite place, eyeing up Sweet Treats goodies. My son calls it the pink shop, he loves going there. Excellent customer service, Naz does an excellent job along with his 3 helpers.